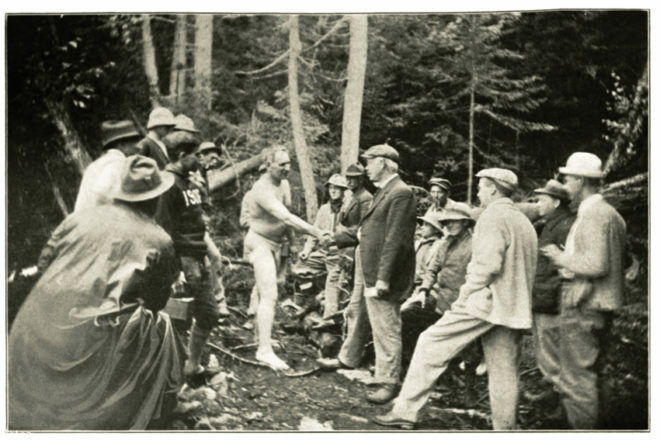 In August, 1913, pudgy middle-aged Joe Knowles stepped naked into the woods of Maine, to see if he could live as a primitive man. When he returned home to Boston two months later, clad in a bearskin, 200,000 people greeted him. © 2019 Bill Donahue. All rights reserved. Cycling in the hills of New Hampshire, by Hector Emanuel. Cross country skiing in the Alaskan Arctic, by Otso Könönen. Interviewing Syrian refugees in Idomeni, Greece, by Julius Motal. Among the Maasai in Kenya, by Georgina Goodwin. At the desk, by Julie Keefe. Outside the barn, by Chris Polich. Website by curio museum design.